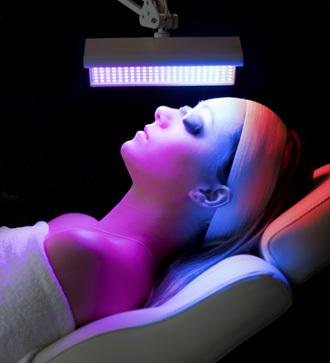 JR Beauty Aesthetics clinic is pleased to offer LED Light Therapy. A painless, non-invasive, affordable treatment Which is great for a variety of conditions. LED light therapy delivers customise skin treatments using combinations of clinically proven blue, red or combination of both wavelengths to boost collagen and elastin production, reduces redness irritation and blitz blemish causing bacteria. For a more youthful, healthy radiant complexion. Book your LED light therapy consultation today with the JR Beauty Aesthetics team. LED light therapy uses specific colour wavelengths of light that penetrate the skin at varying depths. The LED light works to energies cells in the skin to produce collagen, improve elasticity and increase blood circulation and oxygen flow while releasing toxins. This stimulates the anti-ageing process, helps to normalise cellular imbalance and improves skin tone and clarity. LED Light Therapy causes no pain or discomfort and each session of the treatment takes approximately 20-30 minutes. This LED treatment works as a stand-alone service or can be combined with other technologies and treatments at JR Beauty Aesthetics Clinic. The use of LED light therapy technology and realistic expectations we can perform can be customised and we can offer bespoke unique treatments for every individual through our highly trained JR Beauty team. Please talk to your JR Beauty technician about LED light therapy on your next visit or contact us via our contact page to book your FREE consultation. How LED light Therapy works!